← Ball Pit of DOOM! The biggest science story online this week was very big indeed. About 60 tons, in fact. The gigantic carcass of a blue whale has washed up onto the beach in Trout River, Newfoundland, and some fear it could explode. The whale carcass, which is estimated to be 81 feet long, has been swelling for several days due to the buildup of methane gas inside the body. And yes, as many of us learned this week by watching disgusting but riveting videos, a dead whale can explode. Luckily, our scicomm friends are on the case. Marine ecologist Andrew David Thaler, aka Southern Fried Scientist, set up a website called HasTheWhaleExplodedYet.com, which instantly went viral. And, to prove that even a swollen dead whale can be a teaching tool, Aatish Bhatia wrote this terrific post using physics to work out the velocity of guts spewing from an exploding whale. 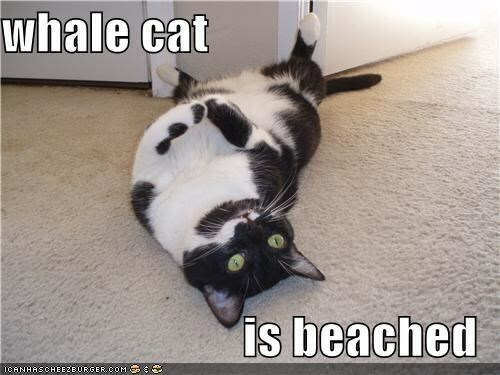 This entry was posted in Science Caturday and tagged beached whale, exploding whale, whale cat, whale physics. Bookmark the permalink.